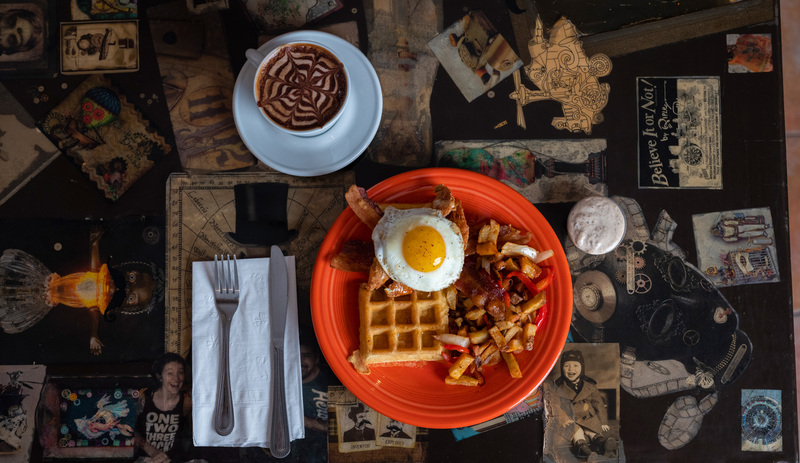 Serving up everything from pancakes to pozole, these neighborhood spots will help you greet the day in a leisurely way. 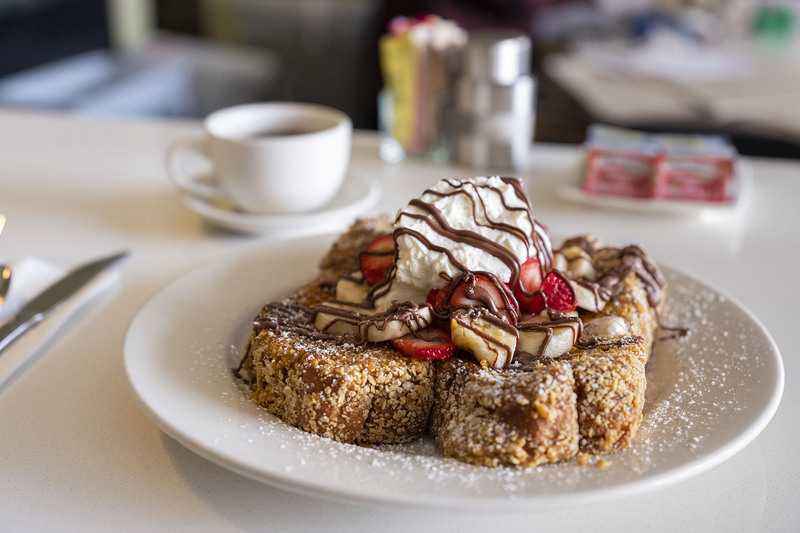 TOP THIS Bea Bea’s is all about creative and customizable options, like this crunchy cornflake-coated French toast topped with strawberries, bananas, Nutella and whipped cream. Photo by Daniel Deitch. Brunch is more than just a combination of breakfast and lunch — it’s the best of both worlds. While it’s often rumored in culinary circles that chefs are not fans of Sunday brunches, having likely just wrapped up a massive Saturday evening service, this special late-morning meal that merges the realms of sweet and savory is a clear favorite of patrons. And in a bustling community like ours, it’s practically a culture unto itself. 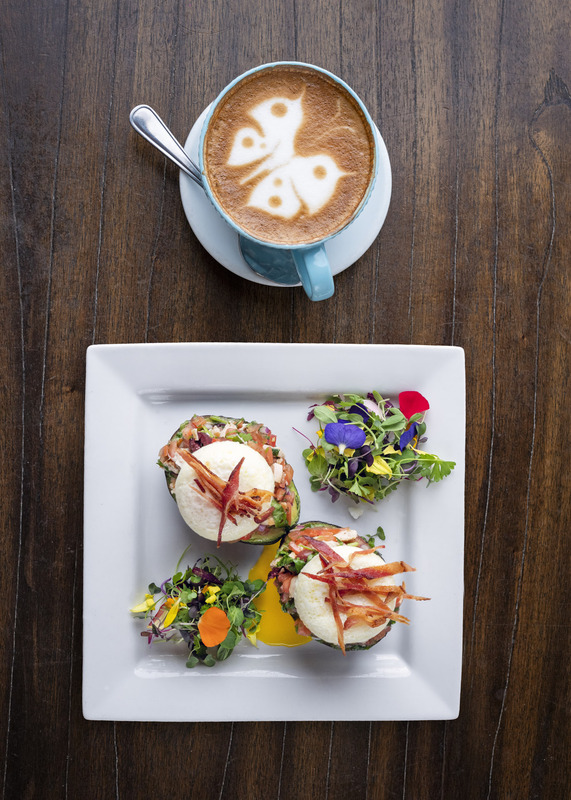 The “Avo-licious” stuffed avocado at Aeirloom Bakery includes rosemary chicken, tomato, Kalamata olives, bacon and optional poached eggs. Photo by Daniel Deitch. Brunch has evolved into a special occasion, where family and friends come together to talk, laugh and share an indulgent meal, sometimes with the bonus of bottomless mimosas or craft Bloody Marys. With vibes that range from elegant to playful while offering near-limitless gastronomic options, it’s the go-to way to celebrate holidays, baby showers or just an ordinary lazy weekend. Whether you’re looking for comfort, luxury or a little of each, our area has a bevy of restaurants to help you find your brunch bliss. Toluca Lake’s Aeirloom Bakery is housed in a cottage-like setting with communal seating where breakfast is served all day, every day. The substantial menu includes traditional items like omelets and eggs Benedict, or you can try something more unique, like the muffin scramble (with organic scrambled eggs, Fiscalini cheddar, fried capicola and English muffin) or the blackberry crunch French toast. 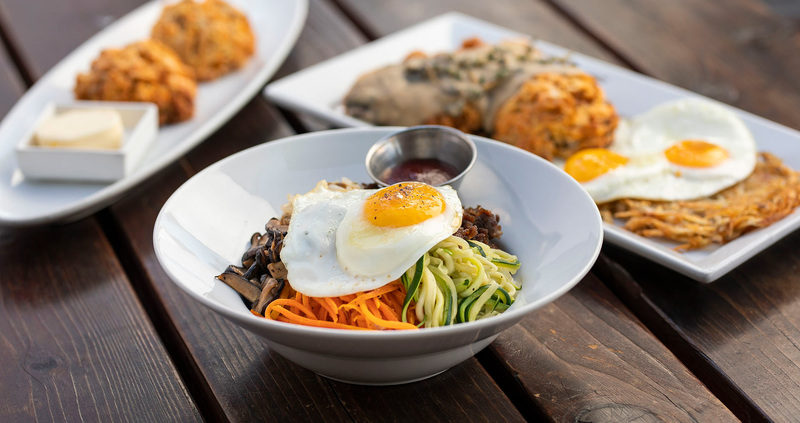 Hungry Crowd’s brunch bibimbap features bulgogi with veggies and a sunny-side-up egg — and don’t forget to order kimchi biscuits. Photo by Daniel Deitch. Speaking of unique, Hungry Crowd features “Seoul food” for brunch. The kimchi biscuit is made with bacon, cheddar, scallions and lemon butter, while the sunny-side-up egg comes with a galbi patty, white cheddar, galbi gravy and chives on a bed of rice. Located beside Universal Studios on Cahuenga, Ca’ Del Sole has long been a favorite of studio execs for power lunches, but its Sunday brunch is quite a delight, too, putting an upscale Italian spin on favorites like omelets (including one with lobster and Brie). Nearby Sweetsalt has a terrific daily morning menu and opens at 8 a.m. in case you need to get your brunch fix on the early side, with creative options such as a truffled egg sandwich or Spanish sardine toast. Tujunga Village may only be a block long, but it boasts a number of choices, like Caioti Pizza Café — don’t be fooled by the name; it also makes one of the best breakfast burritos around. Across the street, stalwart Vitello’s happily serves up its customary California Italian classics at brunchtime, along with a special menu of breakfast favorites like avocado toast, short rib hash, and steak and eggs. The breakfast tostadas at Aroma Coffee & Tea are topped with grilled chicken, black beans, scrambled eggs, guacamole and pico de gallo. Photo by Daniel Deitch. In Studio City, Top Chef fans will want to check out Black Market Liquor Bar, where fan-favorite contestant Antonia Lofaso is executive chef. The menu is styled for sharing, with choices like Röckenwagner banana nut pound cake or smoked ocean trout on ciabatta with pickled baby veggies and quail egg. Not to mention there are five Bloody Mary choices: the traditional (vodka), the Maria (tequila), the Lawrence (corn whiskey), the Michelada (beer) and, of course, a “Bloody Hell” (London gin). 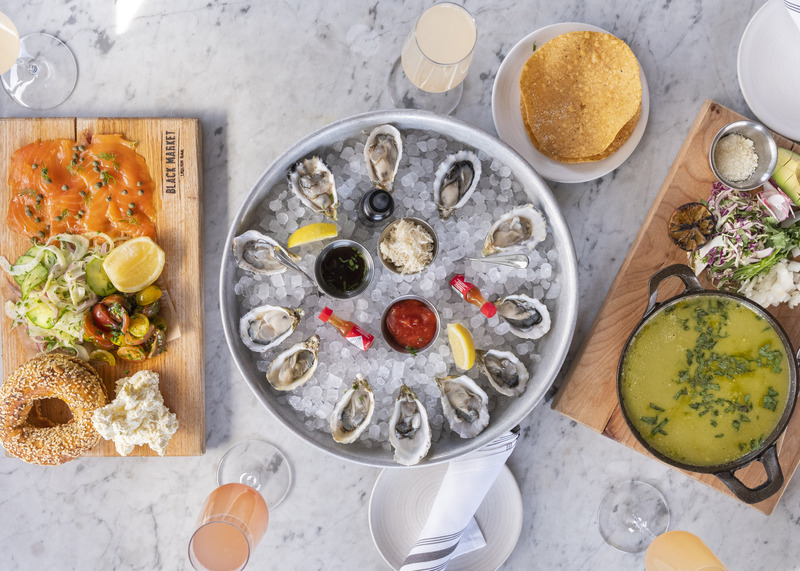 SUNDAY CHIC Among the elegant brunch options at Black Market Liquor Bar are a gravlax-and-bagel spread and oysters on the half-shell served with Kikori whiskey. Photo by Daniel Deitch. In North Hollywood, SteamPunk Coffeebar and Kitchen is as quirky as it is delicious, and fans of steampunk culture will be glad to know it also sells art pieces and knickknacks. Don’t let the tiny parking lot or long wait deter you; there’s street parking in the area and board games are available to occupy your time. In addition to familiar favorites like scrambles, burritos and waffles, there are Röckenwagner soft pretzels with a variety of toppings, from eggs and cheese to peanut butter and bananas. SAVORY STACK The house specialty at SteamPunk Coffeebar and Kitchen is The Stack, a sunny-side-up egg, buttermilk chicken and bacon on a Belgian waffle served with a side of kale or potatoes. Photo by Daniel Deitch. 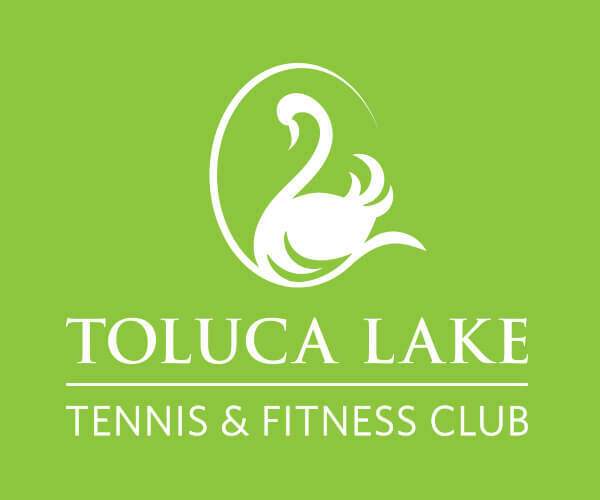 To the east, in Burbank, Tequilas Cantina & Grill starts service on Saturdays and Sundays at 9 a.m, but the special menu sticks around all the way until 2 p.m., so fear not, late risers! The savory Mexi-brunch includes an amazing pozole verde — a green tomatillo broth with cilantro, garlic, hominy and chicken. It is lovingly garnished with cabbage, onions, crushed red pepper and radishes, and comes with a tostada for your dipping enjoyment. Go for the red pozole if spicy is your vibe, and there are, of course, a number of huevos (egg) dishes. Bea Bea’s is an iconic Burbank all-day breakfast spot, where it seems like you can get almost anything on or in a pancake, waffle or French toast, from fruit and nuts to Thai tea or Oreo cookies, as long as you come with a big appetite and the patience to wait for a table. Olive & Thyme leans more toward the healthy side of things, with a menu made daily from scratch from locally sourced items, though there’s a coveted pastry case as well. Granville now has three locations in our general area (Studio City, Burbank and Glendale), and if you find yourself in one of these modern-casual settings, you absolutely must try the awesome Dutch pancake. Brunch has seen a grand evolution since the word was first conceived in the 1890s by British writer George Berringer. Once a mere convenience — a way to serve up leftovers from the night before — it’s now a major event on the social calendar, encompassing lavish buffets, scrambles and mashes, vegan smoothies and everything in between. No doubt the meal will continue to grow, change and find new fans. Here’s to many fabulous brunches in the new year!